If you are taking out a mortgage, or re-mortgaging your property, you may be asked by your mortgage provider or insurance company to provide an arboricultural report (also referred to as an arboricultural survey or tree survey for mortgage purposes). An arboricultural report is a specialist type of report produced by a person who has expert knowledge about the management of trees in relation to buildings and structures (an arboricultural consultant). Large tree growing in close proximity to adjacent house. Often, this type of report is requested after the mortgage provider’s building surveyor has assessed the property. If required, the typical cost of a tree survey for mortgage purposes should be between £200 to £250, which will identify and recommend ways to manage the potential risk posed by trees to your property, with the aim of preventing potentially costly buildings repairs. An arboricultural report has two purposes. Firstly, as mentioned above, the first purpose is to inform mortgage providers or insurance companies about the likelihood of potential structural damage and prevent building repair costs. The second purpose of a tree survey for mortgage applications is to establish the level of risk that trees pose to people and property via falling branches, raised paving or complete tree failure due to the poor condition of a tree. 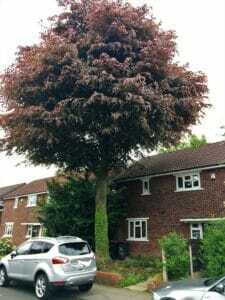 The arboricultural report should include an estimated cost for any recommended works, which can be used during discussions with the mortgage lender, should a retention be suggested. The request of an arboricultural report by a building surveyor during a mortgage application is not necessarily an indication that trees or vegetation are certain to cause building damage. Usually, tree works are often recommended to ensure that trees and vegetation are maintained to prevent them from becoming large specimens and are more manageable within the garden. Often a regular cycle of pruning works is recommended for larger trees. Sometimes, when no other options are available, trees will need to be removed. However, this action should only be undertaken after consulting a qualified arboricultural consultant as this can aslso lead to structural damage. All types of trees, large shrubs and climbers must be surveyed to assess their potential ability to affect a structure, paving or garden wall. However, just because trees and vegetation are growing close by, this does not mean that they will cause damage. In fact, the majority of trees and shrubs within our gardens will never cause any type of problem. But, as a precautionary measure, by assessment of tree species, size, age, vigor and proximity to structures the level of risk that trees or any other large form of vegetation (e.g. an overgrown ivy climber) can be assessed and management works recommended. Large tree has caused adjacent boundary wall to collapse. Prior to undertaking any tree works, a statutory tree protection enquiry must be made with the local planning authority. Checks must be made to establish whether the trees are protected by a Tree Preservation Order and/or whether the trees are located within a Conservation Area. 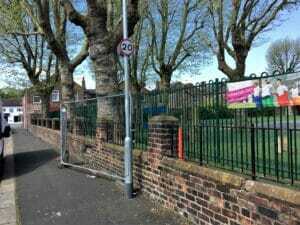 If protected, substantial fines will be issued where protected trees are either removed or pruned without consent. It is recommended that qualified and experienced companies are sort when appointing tree work contractors and they should be approved under the Arboricultural Association Approved Contractors scheme. It is essential that all appointed tree work contractors have adequate Public Liability, Products Liability and Employers Liability Insurance. All tree works must conform to the current BS 3998 “Recommendations for Tree Work”. It is essential that those appointed to undertake any tree works carry out adequate checks to ensure that no statutory laws are contravened during tree work operations.